More than just a toy for engineers, 3D printing is beginning to move from experimental tech to multi-disciplinary learning tool. 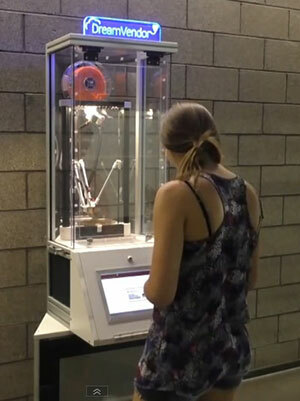 A young woman walks up to a vending machine, slides her student ID card, plugs in a USB drive, specifies the right file, chooses a color and starts the production process. When her object is printed, the machine shoves it into a tray and sends her a text message that it's ready for pickup — practically like buying a Snickers bar. So goes another print job for DreamVendor 2, Virginia Tech's latest experiment in open-access 3D printing. Unlike most schools, which put their specialized printers behind a locked door and only in easy reach of experts, this vending machine self-opens for business at 8 a.m. and shuts down at 5 p.m. In between, the printer extrudes hot plastic into whatever shape the students' designs specify. "It's in full use eight hours a day, five days a week," said assistant professor Christopher Williams, the guy who thought it up. Williams directs the Design, Research, and Education for Additive Manufacturing Systems (DREAMS) Laboratory and co-directs the university's Center for Innovation-Based Manufacturing. By spring semester he expects to have four DreamVendors in operation. Although the vending machine sits inside the university's signature engineering building, Williams is astonished by how many other disciplines are represented among the students standing in line to get their turn — visual arts, computer science, math, business, history and the rest. A Northwestern project is exploring the use of 3D printing to create new fuel cell designs. Yale is teaming up with a company to develop 3D printed biomedical technologies, including cranial and facial devices that can be directly attached to tissue. Yet the flip side of all that variety is a lack of consistency. What will be required to take 3D printing out of the experimental and research realms and place it into the classroom as a technology worth using and a subject worth learning as a matter of course? In April, the National Science Foundation made a foray into answering that question when it hosted a workshop led by Virginia Tech's Williams and Timothy Simpson, a professor of engineering at Penn State. Participants from academia, government and industry looked at the "educational needs and opportunities in additive manufacturing." The focus was on engineering specifically, "because that's where the technology came from — to print models of products," explained Williams. However, what comes out of the initiative may turn out to have practical application for institutions far beyond that set of degree programs. Among the recommendations cited in a follow-up report, the field needs a few important elements to succeed broadly: curriculum, K-12 outreach, support for community maker spaces and a national network that caters to everybody. 3D printing curriculum. First, education needs standardized course materials. In response, 3D printer maker Stratasys, which presented at the workshop, developed, piloted and released a free, technology-agnostic 14-week curriculum for teaching 3D printing in the classroom. The first of three planned courses, "Something That Moves Something," lays out the case for teaching 3D printing and introduces the important concepts, from design to fabrication. It's structured to include two hours of lecture each week and two to four hours of lab time. A planned second course will cover multi-material printing; a third course will teach how to integrate 3D printing into electronics and robotics. Shelly Linor, Stratasys' director of global education, envisions the material to be a "cumulative curriculum." "Because this is such a dynamic arena, maybe a year from now we [will] need to cover organ printing, printing buildings or things like that. We want to always stay ahead of the curve," she said. To move that effort along, the company is offering educators free filament to share their own content and lesson plans with the community. K-12 outreach. Second, 3D printing needs to gain a bigger foothold in K-12, particularly as a component of STEAM (STEM with the arts thrown in). The idea is to show educators how to engage their students in "hands-on, tactile and visual learning activities," to improve their perceptions of engineering and manufacturing. Virginia Tech offers one approach: The university runs an NSF-funded project that brings in middle and high school teachers for a five-week research experience. They participate in cutting-edge manufacturing research, translate that into classroom lessons and take home a 3D printer to use in their schools. Williams estimates that about 40 Virginia teachers will have gone through the program by the time the grant ends next September. More maker spaces. Third, the general public needs more exposure to 3D printing and access to training and experience in community maker spaces. These could take the form of public sites, such as "MAKE-braries" — libraries with maker spaces. Or they could follow a format pioneered by Arizona State University, which partnered with the city of Chandler and TechShop, a network of maker spaces around the country, to give students free membership and equipment training at its Chandler Innovation Center. The city owns the property where the center is located; TechShop runs the facility; and the university offers classes and degree programs. 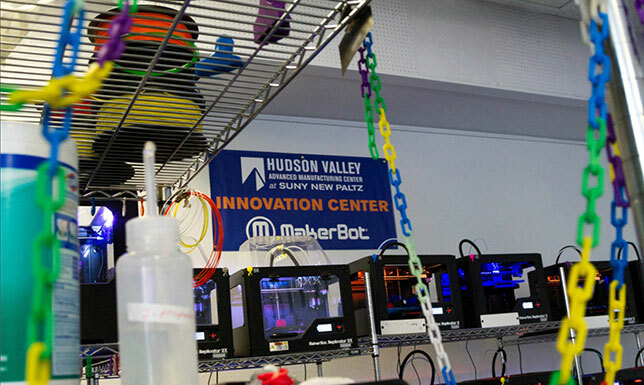 State University of New York New Paltz is the site of the first MakerBot Innovation Center. MakerBot, which is owned by Stratasys, hopes to open a bunch of the sites, which will be packed with 3D printers, 3D scanners and training opportunities. The SUNY center is being used not only by students and faculty but also by members of the community and local industry. In July, the center was the site of a workshop for K-12 educators to learn more about digital design and fabrication and their use in the classroom. Regional hubs of expertise. Fourth, the field needs a national network that would provide both formal and informal learning opportunities for "K to gray." Williams likens this to the network that exists for nanotechnology — regional centers that would pull together local colleges and universities, government agencies, employers and professional organizations to develop a spectrum of resources related to 3D printing. These "hubs" would provide access to technology suitable for a variety of applications, from somebody doing technician training all the way to somebody performing Ph.D.-level research. An offshoot would be the development of digital materials available for use by anybody, and especially for educators: slides, lectures, videos, demonstrations, assignments and assessments. If this to-do list sounds ambitious, it's also necessary, Williams asserted. The divided worlds of design and traditional manufacturing have collided and no longer exist as separate entities. That means in order to ply their degrees, individual students need to be prepared to "hold all of that information in their brains," he said. "We need to be teaching our students about traditional manufacturing as well as digital manufacturing because future engineers need to be able to make educated decisions about which technology to choose from." Now that many institutions have 3D printing equipment "in house," as Williams put it, the next step is to get undergraduates engaged. "The younger generation understands this," he mused. "They understand the potential. They think about digital everything — digital distribution of music, digital distribution of documents. They understand what could happen with digital distribution for products. They think in virtual space." Of course, bringing digital ideas into the real world requires access to the equipment, something some campuses are loath to permit. "They're so afraid for their investment, they don't want to hand it over to anybody," Williams said. "But when you find the right students who have got that mindset, handing that over to them is the best thing you can do. They will take care of it. They are honored by the opportunity to work with a big machine." Williams' advice: "There are definitely students on any campus who will say, 'Man, 3D printing sounds great. I wish I had one.' Let them have it and see what they can do. You'll be very surprised and amazed." Autodesk was an early proponent of the White House's ConnectED Initiative, committing to giving away $250 million worth of software and services. The original idea — to put 3D design software into the hands of high schoolers — has expanded, and the company will now provide one copy of any of its software to secondary and post-secondary students, instructors and institutions. Kickstarter is jammed with proposals for new 3D printers along with 3D printing add-ons, accessories and services that will let customers design and print their own objects or will do the design and printing for them. One of them — the FLUX, envisioned by a group of young Taiwanese — is an all-in-one device that does 3D printing, 3D scanning and laser engraving; it raised almost 1,500 percent of its goal, nearly $1.5 million. Mcor Technologies is offering educators "three years of unlimited free consumables" (paper) for its unique paper-based 3D printer.